Books and Articles - NeuroComScience, Laboratorio di analisi comportamentale - Comunicazione non verbale. Jasna Legiša (2015). I read you in the face, Armando Editore. 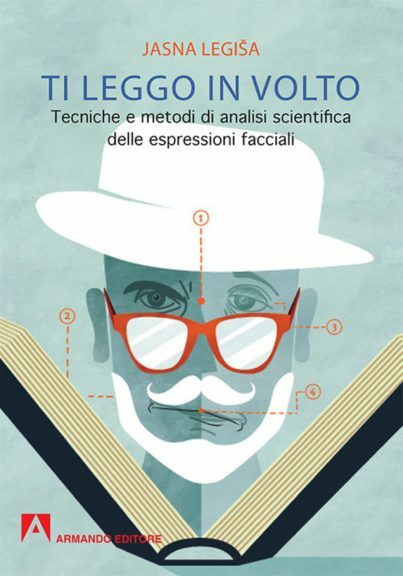 This is the manual, wrote in Italian language, which describes the techniques of scientific analysis that investigate the facial expressions. What are we communicating when we wrinkle our nose? Why do we frown? It is the manual very easy to read, very pleasant for those who wish to deepen their scientific knowledge on facial expressions linked to emotions, common to all human beings. The practice that dates back to the second half of the nineteenth century, full of different theories and methods that, over the years, have been developed by numerous scholars and researchers. The book is accompanied by series of supporting photographs that help us to understand the facial expression and how they can be decoded from time to time. Jasna Legiša – the director of the NeuroComScience Laboratory of Behavioral Analysis – introduces in Italy some applications of scientific techniques of non-verbal analysis, including the inclusion of them in the investigative field and in the selection of staff. You can buy the book online, on Amazon, in all the libraries that hold Armando Editore, or at our laboratory. Jasna Legiša & Jessica Vascotto (2015). The text about the reading of facial expressions of primary emotions, included in the Manual of comparative medical semiotics, in order to illustrate the non-verbal recognition of fear, joy, anger, disgust, surprise, sadness. It is the public research in leading the international scientific journal of autism. The objective of this study is to provide a greater understanding of non-verbal communication in autism. Were compared the physiological and behavioral responses in children with high functioning autism and those in children without developmental disorders in response to various types of odors. The results show that the physiological responses (changes in heart rate, breathing, handheld conductance) and the facial behavior responses coincide between two groups, while the explicit subjective perception in verbal responses is different. Luc Marlier, Christophe Gaugler, Jasna Leghissa, Thierry Pebayle, National Center of Scientific Research, and University of Strasbourg, France. The non-verbal communication in preterm infants between 22 and 26 weeks of gestation has been poorly studied. Together with the National Research Center of Strasbourg, were examined the experiments which analyzed the facial expressions during various types of olfactory stimuli. The same contractions of the face of disgust and pain were detected in the children and in the adults. Smiles can also be observed, but they appear less systematically to respond to the stimuli. Another research on non verbal communication in preterm. Using the judgment method, to the adult observers were shown the videotapes of the newborns’ odor-elicited facial responses and they were asked to identify the valence of the eliciting stimuli. The findings indicated that the adults were able to detect the differences in the hedonic tone of premature newborn’s facial responses as the function of the stimulus valence. Taken together, these results indicate that the newborn’s facial responsiveness carry the social signals that are clear enough to inform the adults about the hedonic tone of inhaled odors, demonstrating the emotional and communicative function of human facial behavior from the first stages of development. Jasna Legiša & Enzo Kermol (2009). Verification of emotional perception through the application Facial Action Coding System and physiological measurements in response to audiovisual stimuli. Metis, 16, 1, 135 – 151. The main objective of this research is the analysis of facial expressions, the physiological reactions and subjective evaluation of emotion in response to highly emotional audiovisual stimuli. 11 males and 10 females between the ages of 22 and 32, individually watched three film scenes, sitting comfortably in the chairs positioned about meter and a half from the screen. In the soundproof room, divided in half by one separé, there was the video camera next to the screen, which took the front of the subject’s face, while monitoring the heartbeat and electrical resistance through the electrodes connected to the equipment placed, behind the separé. The analysis of the facial expressions was carried out by applying the Facial Action Coding System method, considering all the Action Units (AU), their duration and intensity. The results of the experiment showed that certain Units of Action appeared on the faces of the subjects, the trend of the physiological responses and the responses of the subjective evaluation, characterize each of the three scenes, which leads to suppose the existence of shared emotions during the filmic vision. There were the significant differences between males and females regarding the facial movements and physiological responses. The aim of the study was to define the nature of perception and emotional expression. They were analyzed in two studies. The physiological, behavioral and verbal reactions are analyzed in various types of sensory stimuli. Two studies were carried out in which the visual stimuli were used. the higher frequency of individual differences in the facial behavior, such as hemi facial spasms, the asymmetry of facial behavior.